We’ve already got wearable technology down when it comes to lighting and an augmented reality interface, but what about storage? Two NASA scientists have figured out a way to weave copper wire into a form for memory storage. Jin-Woo Han and Meyya Meyyappan of the Center for Nanotechnology at NASA Ames Research Center developed the memory fiber. 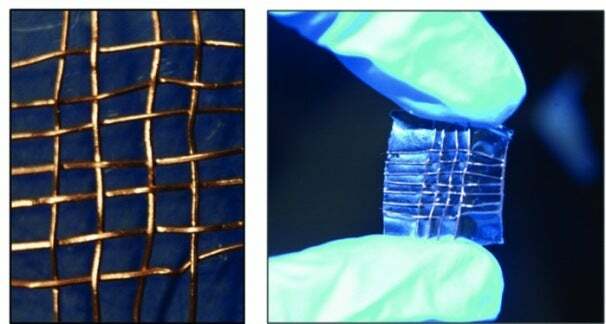 The design uses two 1-mm copper and copper oxide wires interweaved in a crisscross pattern sandwiched together by a small piece of platinum. The resulting structure forms a resistive memory circuit that can retain data, which can be read and rewritten when a current is applied, for more than 100 days. This e-textile design follows the same basic crosshatched properties of real fabric, so it would be fairly easy to form wearable memory into any piece of clothing. Now all we need to do to make ourselves a real walking-talking mobile-computer is to put together all the mobile sensor, storage, processing, displays, and power source solutions into one package—that will hopefully look cooler than the “cyborgs” in Snow Crash.